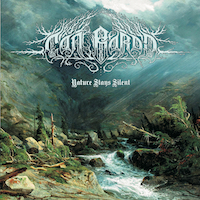 From starting piano lessons as a child to joining folk metal band KAATARAKT, the musical journey of CÂN BARDD main man Malo Civelli has culminated in “Nature Stays Silent”. The music is described as epic/atmospheric black metal, and there were some great moments fitting those descriptions on the album. “Introduction” is a stunning opener, which builds up to moving riffs which have a slightly drawn-out note that tugs at the heartstrings. The delicate acoustic passages and deeply resonant drums create a very effective build-up. The more traditional black metal elements are perhaps somewhat subdued, but make an appearance in the coda with slow riffs which are somewhat reminiscent of FORGOTTEN WOODS. “My Ancestors” carries on the moving effects of the first track with its melancholy plucked cello. The guitars and strings build to a towering crest, and are then swept along by the powerful blast beats. The quiet break is effective, and the flute adds a sense of lightness, making for an effective contrast with the black metal elements. Faraway vocals invoke nostalgia. The harmonies of the Spanish-style guitar parts were beautiful. “Méditation Glaciale” definitely matches the word “epic”. Ethereal chanting and cellos open the song, and the slower pace gives the listener a break after the faster parts. The flute which follows the vocals adds a touch of mysteriousness. The black metal elements surge forwards with echoing lead guitar notes, and the violins add a sense of pathos. The sparkling synth notes and acoustic guitar parts create a happier feel. The sombre clean vocals are enhanced by the melodies around them. The delicate piano riffs mixed with the bubbling distorted notes add tension. However, things start to drift musically around “Océan”, where the tracks feel slightly too long. The ideas are good, but perhaps outstayed their welcome somewhat. But I couldn’t point to any of these tracks and classify them as “bad”. The Celtic-style musical elements on “Océan”, especially the pipes, are beautifully done, and the strings on “Abîme” are poignant, for example. There’s a good formula going on here, which I hope will be continued on the next release. I also hope for a little bit of tightening up in the songwriting department. “Nature Stays Silent” is a big album musically, and overall things are held up well. An already-strong castle can be made even stronger by adding reinforcements and a few adjustments.